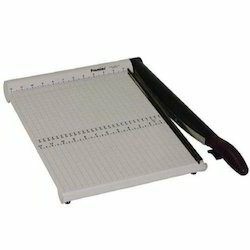 As a vital entity of this domain, we render the best quality of 15' Manual Paper Cutter Their superlative performance and compact design makes these paper cutters highly demanded. We are remarkable entity, engaged in offering superior quality Manual Sample Cutting Machine. We are offering to our clients, Manual Strap Cutters, which are widely used in various industries. These are available with steel rolls, leaded cast iron housings, gears of steel with reduction gear box. We offer a wide range of Manual Strip Cutter that are reckoned in the market for its unique designs and for delivering outstanding services. Our expertise also allows us to custom design the products as per the specifications of the clients. Weight: 0.750 kg / 1.65 lb. With an objective to fulfill the ever-evolving demands of our clients, we are engaged in offering a wide assortment of Manual Plasma Cutter Machine. With rich industry experience and knowledge, we are manufacturing and exporting a qualitative range of Cashew Nut Manual Cutter.Offered product is used for effective shelling of cashew nuts. This product is manufactured using the finest quality raw material and advanced techniques under the guidance of skilled professionals.